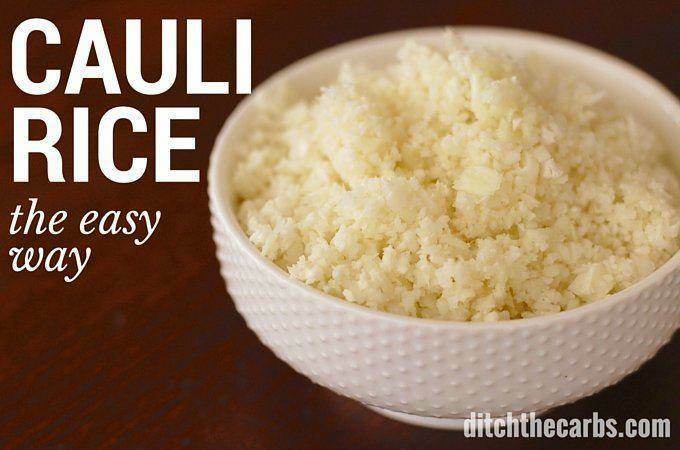 Follow this recipe for a simple way to make cauliflower rice. You can adapt and flavour cauliflower rice any which way you like. If you are new here, this page and this page may help you. 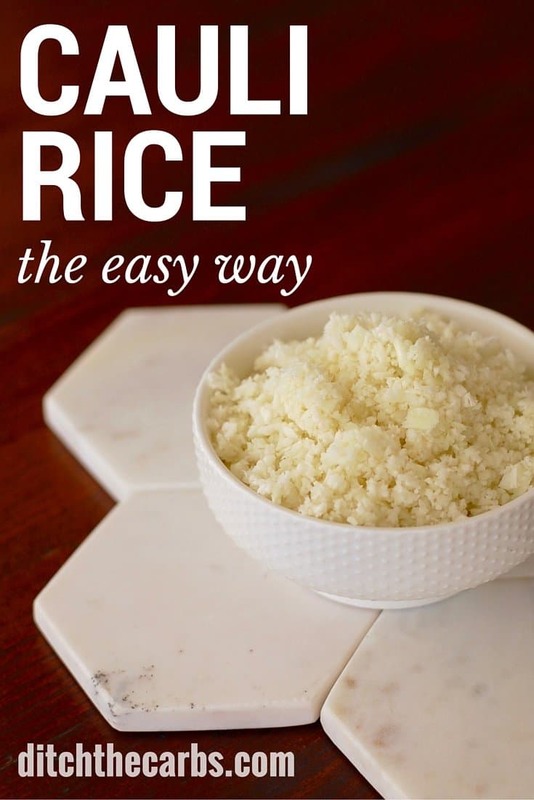 If you haver ever made cauliflower rice with a hand grater/shredder and found cauliflower covering your entire kitchen, then SCROLL DOWN to watch the video, and watch how I end up with ZERO mess using my method. 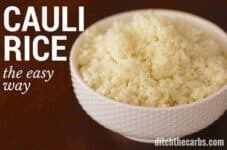 If you have been eating low carb for a while, you will have heard of cauliflower rice. What is so wrong with rice I hear you say? Rice is incredibly high in carbs and isn’t that nutritious. See the comparison below showing Cauliflower Rice being far superior. Cauliflower is incredibly low carb, high in fibre, Vit A, Vit B6, and Vit C. The calcium and magnesium are slightly lower, but this is of little concern when eating LCHF because your entire diet will be high in these anyway because we emphasise variety and whole foods. Another point to remember with rice, is that many people either overeat (who eats just 1 measured cup) so could easily consume a few days worth of carbs in one sitting, or they cut back trying to be good, where in fact they haven’t even consumed the small amount of nutrients stated below. With cauliflower rice, the sky is the limit. 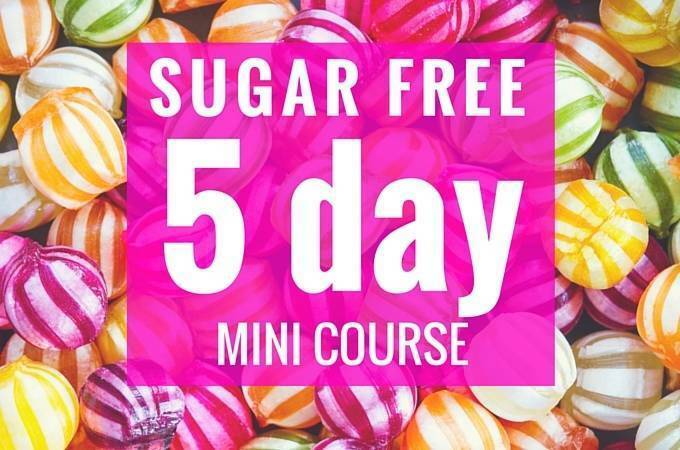 You can eat and eat as much as you like without feeling guilty or feeling bloated and stodgy for hours. When I explain that we have gone low carb, many react saying it is restrictive and not healthy. I have never eaten so many healthy vegetables in years. I eat more vegetables than many vegetarians I know. My children have never eaten so many vegetables, and such a wide variety. Yes it takes a while to get used to doing things a bit differently, but it soon become the ‘new normal’. I try and make all my recipes as easy as possible. I don’t use a hand shredder/grater, I don’t pre soak, I don’t pre season…. I shred/grate it all using the blender, then cook in coconut cream and seasoning. All in all it is actually quicker than cooking rice! I like to flavour mine so it is not so ‘cauliflowery’, but plain rice needs flavouring too. Cauliflower rice can really add to the meal, rather than being the vehicle for the meat to go on. Once you have mastered cauliflower rice, you can flavour it any which way you prefer to match the dinner it will be served with. Coconut cream for a curry meal or garlic or ginger for a Chinese meal. 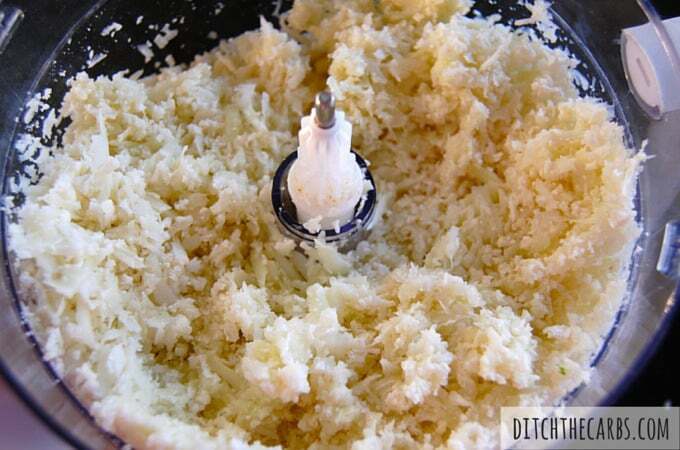 Grate/shred all the cauliflower using the blender. Place in a large saucepan and add the coconut cream, coconut, coriander and salt. Cook on a medium/high heat until softened, stirring occasionally to stop the coconut cream from burning. Garnish with more coriander and desiccated coconut. Cauliflower rice can be served with these dishes – can you tell I love curry recipes? Is this a good recipe to meal prep with? How long does it stay fresh in the fridge? Yes, this is brilliant for meal prep. You can cook a large batch and keep in the fridge for a few days OR you can even freeze cauliflower rice, ready to reheat when needed. YAY! i find that it gives a lot of water even when lightly stire fried. Are you using fresh or frozen? Fresh cauliflower should be nice and dry. I add coconut cream and sometimes even turmeric or smoked paprika – yum. What a good idea to use coconut cream and coconut–I bet this would go well with my de-carbed chicken tikka masala! 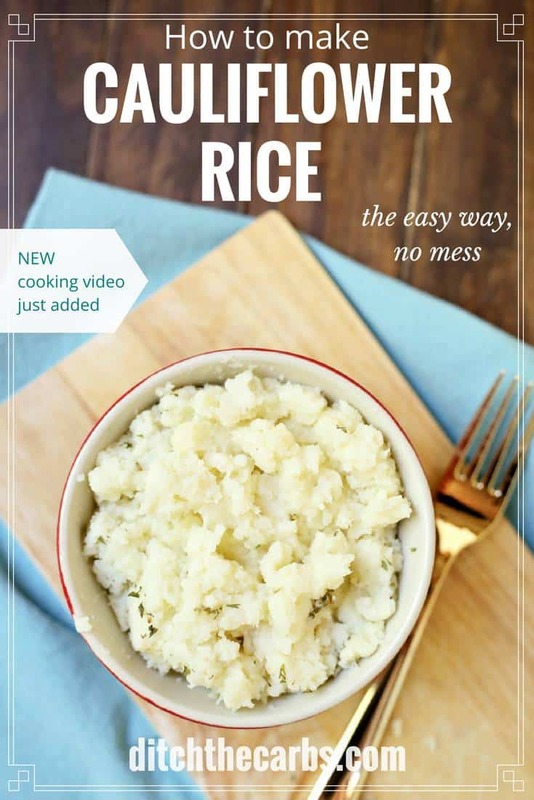 I”ve been making my cauliflower rice by cooking it with a little heavy whipping cream and stirring in a beaten egg in the end, fluffing it up to give it body–that prep is really good with pot roast and dishes with sauces where you want a neutrally flavored rice. I’m going to try your coconut rice next with my new favorite Indian dish, pork vindaloo! Diana this is a wonderful suggestion. As you can tell from the number of low-carb curries on my site, my family an children loooooove curries. Is the total carb = net carb? Or i have to subtract the fiber to get the net carb? 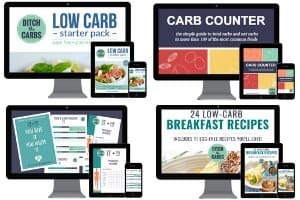 All recipes here state total carbs. To find the net, simply deduct the fibre value. Could you provide an approximate weight for half a cauliflower? Heads vary widely in size here and I would like to try this with the proper ratio of veg to cream, thank you! Gosh I have never weighed my cauliflower, in fact the ratios are there as a guide as I generally throw the cauliflower in the food processor, blitz it up, then pour on the coconut cream and salt. If I were to estimate an amount, I would guess about 4-5 cups of cauliflower once it is processed. Hi Liibby – I’m currently living in Spain & having no luck finding coconut cream. I have found creamed coconut – which is packaged in a solid block. Is it the same thing but just needs to be loosened off? Yes you could use this, just add as much as you think you need to flavour it, and possibly a little water. Karen, where in Spain are you? Here in Costa del Sol we have all the coconut milk and cream we’ll ever need. I like to lightly saute my processed cauliflower in olive oil for my cauliflower rice, as I love the taste of cauliflower and don’t feel the need to add any flavourings. But this makes a nice alternative, especially to serve with Thai and Indian curries where the coconut flavour goes well. Does this taste like coconut? I don’t like the taste/texture of coconut & it seems to be used in so many low carb recipes. I hail your genius! This is better then rice. Absolutely delicious. And perfect with spiced chicken. Can’t wait to try it with low carb green chicken curry bites (a recipe I am yet to devise, but NOW -with this wonderful rice – it will be a priority). Just had this for lunch with baked salmon. No coconut cream, so use heavy cream. I freeze packets of it, so always have it handy. So good! Brilliant! I love your idea of turning it into a chocolate rice pudding – genius. Sorry if this has been asked before but I can’t seem to find it in the comments…does ‘c’ stand for cup(s)? Yes c is the standard abbreviation for cups. I’ll maybe try and write cups from now on. Can anyone tell me how many calories per portion please? Hi. I am single. Can I cook this recipe and freeze the rest for later? Thanks very much. I’m sure you could. Freeze it in individual portion sizes then defrost and heat on the stove top so it doesn’t go soggy. Just like homemade baby food, puree veggies can be frozen in ice cube trays and cooked later on stove top or microwave. Each cube is about 1oz. What exactly do you mean when you say “coconut cream” in the ingredients? Do you mean canned coconut milk? I’m sure you don’t mean that sugared version of cream of coconut. Take a look at my page on Food Brands. Coconut cream is generally only 1-3% carbs and 25% fat, but brands vary widely. Wish my family would eat it better. I keep trying! They do so well with other things, but not cauliflower except served as cauliflower. Will keep trying. Thanks! Try roasting it in the oven. This is my favorite way to have cauliflower rice. I use a little avocado oil, salt, pepper, & turmeric. 30 mins in a hot oven, and you have a delicious side. I just fry it with some olive oil, salt en garam massala.4-5 minutes. No taste of cauliflower any mire and nice and dry! Recipe looks great but the dish you presented it in is beautiful!!! It is so much more interesting to eat food presented well 🙂 and I’m keen to try this as I don’t usually like cauliflower! Not to mention that if you are diabetic like I am, You cannot eat rice at all. this is my new rice!!! It is also my new mashed potatoes.